Carers should spend at least 30 minutes on home visits to older people in England as part of a new gold standard for services, new guidance says. The National Institute for Health and Care Excellence guidance follows reports of carers making visits of 15 minutes and less. NICE recommends a package of measures, which also includes ensuring people's carers are not changed too frequently. But it acknowledged extra money would be needed to fund the measures. Earlier this week, 20 organisations, including charities, care providers and the NHS, published a joint submission to the Treasury ahead of the government's Spending Review in November to urge ministers to protect social care as is being done for the NHS. This is the first time NICE has issued guidance to the social care sector - it has traditionally focused on NHS services. But its remit has been extended as part of a growing recognition that social care services - care homes and home help funded by councils - have a direct impact on the NHS. NICE deputy chief executive Prof Gillian Leng said good quality home care could actually save money as it was less expensive than "care homes or hospitals". 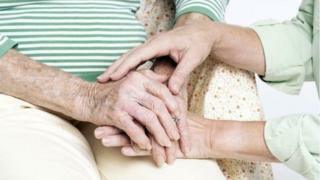 "Without good support, older people can suffer from social isolation, malnutrition or neglect," she said. "They may also be at risk of injuring themselves, perhaps from a fall or other accident." Media captionPaul Cuskin: "The carer started coming later and going home earlier, and on occasion just not turning up at all"
UK Homecare Association chief executive Bridget Warr, who chaired the group of experts behind the guidance, said while some elements of the guidance would not cost extra, more money was needed to afford what was being recommended. "We cannot duck the issue," she added. A Local Government Association spokeswoman said: "Sadly, the rise in short visits is just one of the symptoms of a social care and support system that is under enormous financial pressure." The government said spending plans would be set out in November, but it pointed out that social care would benefit from extra investment in the NHS as a dedicated pot had been set aside to help joined up care between the two sectors. Care Minister Alistair Burt said he wanted to see the sector provide "great care". "This guidance will not only provide reassurance for countless families who rely on this care but for the thousands of workers who want the time and support to be able to give people the care they deserve," he said.